Policymakers operate with a very truncated view of the economy—with little idea of how growth impacts, or is affected by, women’s work. Part of the problem is the ongoing exclusion of the unpaid care work from international definitions of economic activity. This means that for the most part they fail to incorporate this work into their labour market policies. Our experience in attempting to measure women’s economic activity in Bangladesh draws attention to other aspects of the problem. National statistics for Bangladesh suggest a gradual rise in female labour force participation rates since the 1970s, reaching 36% in 2010 but declining to 33.5% in the latest 2013 survey. These surveys, undertaken by the Bangladesh Bureau of Statistics (BBS), use the ILO’s definition of economic activity. According to this definition, economic activity includes the production of goods and services for pay or profit within a given reference period as well as production and processing of primary products for barter or own consumption. Photo by BRAC on March 27, 2009. No changes made. 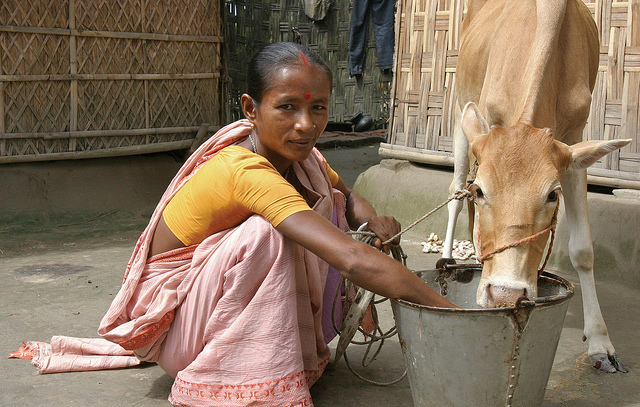 In 2008, as part of a larger project on women’s economic empowerment, a team of researchers from IDS, Sussex and the BRAC Institute of Governance and Development (BIGD) carried out a survey of rural women across 8 districts of Bangladesh covering 35,494 women, using exactly the same definition as the BBS and with training by BBS officials. Whereas the 2005-06 Labour Force Survey had estimated the national FLFPR at around 30%, the BIGD survey estimate was 67%. Extending the BIGD reference period to 12 months increased its estimate to a high of 73%, suggesting much of women’s work was carried out throughout the year (Mahmud and Tasneem 2011). Using both narrow and broader definitions of economic activity, the BIGD study was able to establish the main reason for this discrepancy as the failure of the BBS survey to capture home-based economic activity. In fact, the national estimate of 9% for waged/salaried work reported by the BBS, using a 7 day reference period, was very similar to the BIGD estimate of 10% using a 12 month reference period. What the BIGD survey also made clear was that economic activity within the home was primarily income-earning rather than expenditure-saving and accounted for 48% of the female labour force. The single most important reason for the importance of this activity was the spread of microfinance. Most of these women belonged to microfinance organizations, most had taken loans and most were engaged in rearing livestock and poultry, a key use of microfinance loans. The difficulties of distinguishing between women in income-earning activity within the home and those in expenditure-saving work, which also took the form of rearing poultry and livestock, may explain some of the baffling fluctuations in women’s unpaid family labour recorded by successive labour force surveys. Definitions clearly matter in determining which aspects of work are counted in the labour force but the Bangladesh experience points to the human and organizational dimensions of the problem. One was the tendency on the part of BBS officials to adapt their understanding of the ILO definition of work to “local reality,” thereby perpetuating past biases. A second was the fact BBS enumerators gathered their information from the household head—usually a male—which is a practice that ensures underestimation of women’s work, rather than from women themselves, as was the case in the BIGD survey. These are examples of the kind of gender-biased practices that perpetuate policies, which privilege men’s work and discount work done by women.